You are here: Home » Would You Dare to Climb These 10 World’s Scariest Stairs in the World? Right now we are not going to dare you to rattle your nerves and climb a super dangerous ladder. 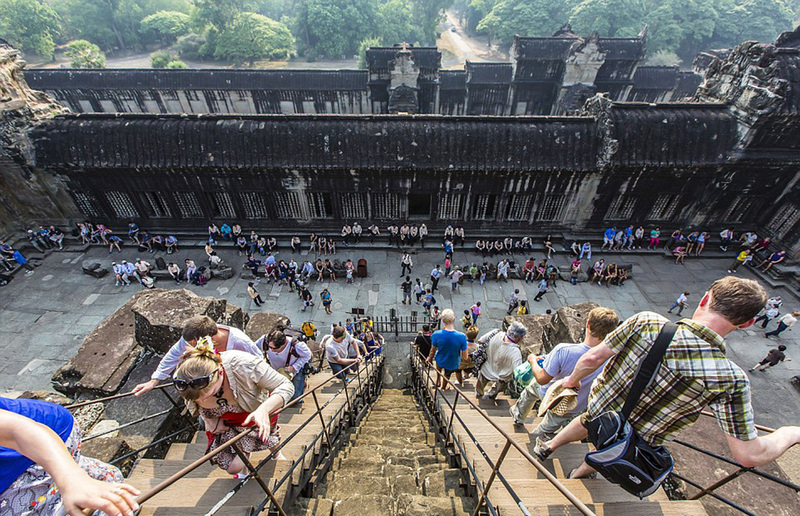 All we want you is to look at these 10 most incredible, frightful and somewhat unsafe stairs in the world. If you do, you’ll make sure that climbing these ladders will turn your walk into a super-adventurous pleasure… or hell! The Angkor Wat temple complex in Cambodia is a significant landmark for Buddhists coming here from across the globe. There is nothing shameful in climbing these steep stairs on all fours or using special ropes, which lead all the Buddhists to the uppermost church. Can you imagine that the stairs’ slope is about 70 degrees? Such a hard climb was conceived specifically to remind the monks of the thorny path to Heaven. And although tourists are allowed to use cable rails or even offered to climb easier stairs to visit the church, the bravest visitors dare to clamber up the way Hindus have been doing that for many centuries. Compared to the religious origin of Angkor Wat stairs, the Pailon del Diablo stairs were built specifically to enjoy tropical waterfall landscapes. Translated as the “Devil’s Cauldron”, this name was chosen for a reason and by looking at the photo Pailon del Diablo ladder, the reason becomes clear. It’s just tough to call a pleasure the process of crossing these steep steps. Because the waterfall adjoins the stairs quite closely, you can hardly find any dry and non-slip steps, as, indeed, the metal railings and fences. First of all, climbing those stairs is not only a test on brevity but also a demonstration of your restraint. Everyone who wants to visit the Half Dome in the Yosemite National Park in California has to make a 7-mile hike through the wild woods and then climb up the mountain using the rope ladder for more than 400 vertical feet. To stay alive during this adventurous journey, you’ll need to have a suitable footwear and wait for the favorable weather. If the humidity is too high, the shoes are slippery, and the hands are sweaty and weak, there is a high chance of a lethal ending. “Is it even worth the risk?” – you’ll ask. Definitely! The actual view from this rock is incredibly beautiful. The ancient city of Machu Picchu is located on the top of a mountain range, so no wonder why there are some dangerously steep stairs built by Incas centuries ago. Do not expect a “light walk” up there. The local stairs were cut right in the granite rock and they are often slippery and covered with smoky haze. Not sure you can handle such an obstacle? Then, better not try. Although, not everything depends on the person himself. In 2010, there were about 2000 tourists stuck in Machu Picchu because of heavy rains that eroded access roads. The government could evacuate tourists only by helicopters, and the landmark remained closed for almost 4 months after. Dreaming of looking at the New York City almost from the very top of America’s national symbol? Well, make sure you are not afraid of heights and enclosed spaces first. The viewing platform is located right inside the crown of the famous Statue of Liberty, and unfortunately, is not equipped with any elevators. To climb up this tiny room, you’ll have to overcome a super scary staircase that looks like a spiral ladder with the gaps’ width of almost 5 feet and 146 steps in length. The bravest and most athletic visitors climb all 377 steps from the entrance to this little room in the crown and that is comparable to the height of the 20-story building. The abandoned Florli Power Station in Lysebotn is one of Norway’s most extreme attractions, and the main reason why it’s considered so is the building’s stairs. It consists of 4,444 steps, and the height from the bottom to the top of the staircase is approximately 5,2 feet. This is the longest wooden ladder in the world, and only the hardiest ones can handle it! There is still no official data on the number of stairs on the slope of this Sacred Mountain of Taoism. Perhaps, people just cannot concentrate on counting as they climb up these stairs and feel all the horror being in the middle of such place. But when the traveler finally gets to the very top of Huashan, there comes more – the path made of only three boards, which are nailed straight to the vertical slope of the mountain, and only one chain to hold. Then comes one more set of winding steps … and finally the traveler can get his reward! What is it? You get a chance to rest in the most remote tea house in the world. After all of it, they surely have to make really good tea there! The steps of this particular staircase are super comfortable and steady compared to ones mentioned above. It has fences and is not that crowded with tourists, so why is it even on our list? What can make your heart stop while climbing this ladder is the stairs’ unique location – the highest mountain peak in the Alps. Strong winds and low temperatures included! Everyone knows about this legendary church of the legendary Antonio Gaudi, which is still in the process of construction. The cathedral combines both traditional religious icons and architecture elements inspired by nature itself. For example, columns and staircases. The only thing, most of the stairs are super steep. One careless move and you can easily fly down through the central part of the stairs. You wouldn’t be able to even hold on something because there are no railings. These stairs are so scary that they’ve been officially closed for visits since 1987. 3,922 steps run along the Koolau mountain range in Hawaii since 1942. In some areas, it gets so dangerous that local authorities set up guards to not let anyone climb the ladder. Some tourists still make their way past the guards and then proudly upload videos showing their heroic actions to social media. In 2014 and 2015, 11 “heroes” got arrested, and 463 people had to pay fines. By the way, the stairs were never considered as a tourist attraction and were originally set to lay the cable to the US Navy base.